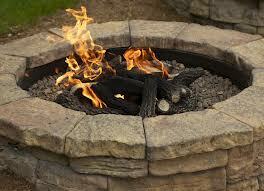 Outdoor fireplaces/fire pits shall be at least 15 feet from any structure or combustible material (i.e. house, garage, deck, fence) and in an open lawn area. Recreational fires not contained in an outdoor fireplace/fire pit must be at least 25 feet from any structure or combustible material and also in an open lawn area. Large outdoor fireplaces that are built on a foundation are allowed however, require a building permit from the City Building and Code Enforcement Department. Use only clean, well-seasoned wood--no leaves, compost, brush, waste materials of any kind or holiday decorations/trees. Some type of fire extinguisher must be available for immediate use (i.e., garden hose or fire extinguisher). The fire must be no greater than 3 feet in diameter and 2 feet high. Open burning is prohibited when atmospheric conditions or local circumstances make such fires hazardous. Be alert to wind speed/direction and courteous to neighbors who may experience respiratory difficulties. A City Fire Code Official may order the extinguishment of any open burning that creates or adds to a hazardous or objectionable situation. For more information, contact the Fire Department at 630-377-4458.